Review | Designer furniture, high fashion and haute cuisine. Without a doubt they all offer more than the average product. Yet, because of their high prices these finer things in life are not affordable for everyone. Now Vauxhall wants to offer an exclusive coupé at an everyday price. The affordable Astra GTC supposedly drives better than a normal Astra as well. Did Vauxhall succeed? The antenna, the wing mirrors and the door handles. Those are the only body parts the GTC shares with the five-door Astra. In other words: Vauxhall wanted to offer more than just a three-door Astra. The three-door Astra is more of a coupé than a three-door hatchback. Thanks to simple, almost sculptured, lines the GTC looks like a true athlete. The wheel arches are much bigger than those of a regular Astra to accommodate the huge wheels with evenly large rims (up to twenty inch). The rear looks muscular and gives the car a strong stance. That was possible because the GTC also differs from a regular Astra beneath the skin. For example, the track width has been increased, which doesn't just improve handling but benefits its looks as well. The wheelbase has been increased to improve stability at high speed. The latter also creates more room in the cabin. For a coupé the Astra GTC is remarkably spacious in the front. For example: with the front seat slid all the way to the back even tall drivers cannot reach the clutch. Despite its sleek lines, headroom is fine. Even more unusual: the Astra GTC has a back seat that can actually be used to accommodate adults. What the GTC does share with the everyday Astra is the spec level. Like the basic Astra, the GTC is fitted with a front camera. This camera recognises traffic signs and shows the maximum speed in a display between the speedometer and rev counter as a reminder to the driver. In the dark, the beam of the headlights is automatically adjusted; without blinding oncoming traffic, of course. As it should be with a modern car, the GTC has been fitted with an integrated audio, sat nav and communications system. The obligatory iPod connection works flawlessly. The sound quality is sufficient, but rather dull for an exciting car like this. Equally important, the Astra GTC can be fitted with special seats that have been developed together with the German institute for healthy backs. These seats are so incredibly comfortable that they alone are a good reason to choose a Vauxhall! Despite its promising looks, the Astra GTC has exactly the same engines as the five-door hatchback and the estate. They develop the same power and, except for a few tenths of a second, deliver the same performance. For next year an extra sporty OPC version has been announced. It is the 1.6 litre turbo engine that especially disappoints. On paper it develops 180 PS, but in daily traffic this is hardly noticeable. Only when the needle of the rev counter is forced all the way into the red area, does the turbo engine perform well. A fraction of a second later the rev limiter kicks in and puts an end to the fun. When the engine speed drops below 2,000 rpm the car almost stalls. Therefore, shifting gears a lot is the advice. This isn't made easy because of the clutch with a long stoke. The clutch plates slip for a long time before they actually close. Because of this, even while shifting gears, speed may drop. A simple hill start also becomes a problem due to this. 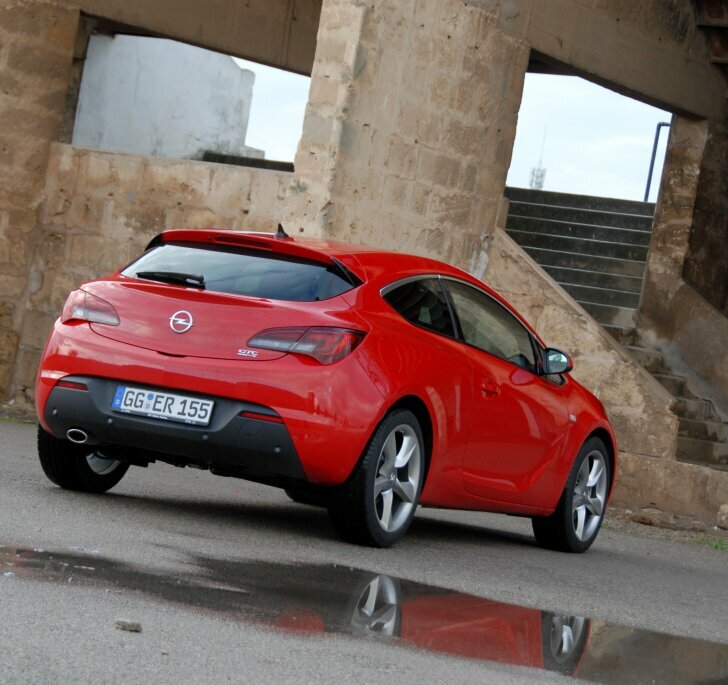 With the 2.0 litre diesel engine under the bonnet, the GTC is a bit more spirited. The diesel has a more direct reaction to the throttle and builds up its power with more enthusiasm. Even the feeling in the clutch is better with the diesel engine. Yet, with this power train the GTC isn't an exciting car to drive either. The brakes are more than a match for the engines. Also, they can stand a fair amount of abuse (for example braking downhill). The feeling in the brake pedal still leaves something to be desired and therefore the GTC cannot be slowed down up to the last millimetre before cornering. Especially for the GTC, Vauxhall has developed a bespoke suspension which is lighter and stronger. The electric motor of the power steering is positioned closer to the steering axle and a smaller part of the front suspension actually has to be moved to pivot the wheels. This effectively prevents the power of the engine interfering with the direction of the front wheels (also known as "torque steer"). On top of that, this so-called "HiPerStrut" makes steering more direct. However, this effect is only noticeable when seriously speeding. During short, sudden changes of direction the GTC reacts quickly. Grip is excellent, but only on dry roads. Because of the tyre size and rim size roadholding on wet surfaces is no more than sufficient. This is why the GTC is only a fast car in the hands of a skilled driver. Even then the GTC hardly comes alive and the expected thrills are still lacking. Pressing the "Sport" button doesn't change this. When trotting along with traffic, none of the alterations to the Astra can be noticed. This certainly isn't a sports coupé that changes every single drive into a party. On the other hand: because of this, the Astra GTC will never be trying on long drives. 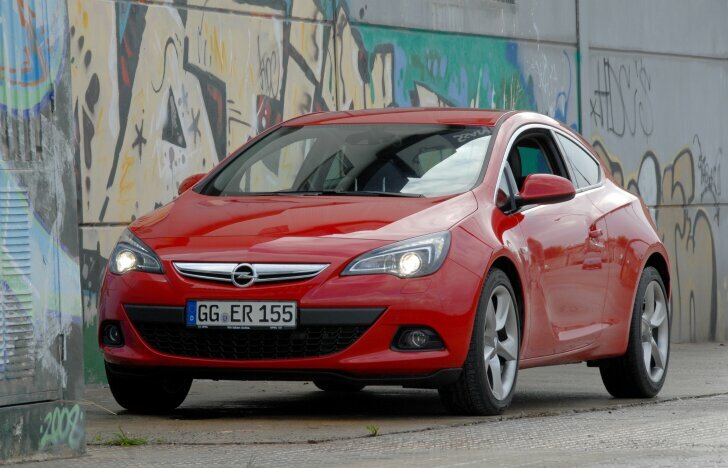 The Vauxhall Astra GTC promises beauty and performace at a modest price. When it comes to sportiness the GTC does not convice. Performance is only marginally better than with a normal Astra. The 1.6 litre turbo engine is especially disappointing because it lacks character. Both handling and steering are better than in a normal Astra, but this only shows on a (preferably dry!) race track. In daily traffic the differences are hardly noticeable. 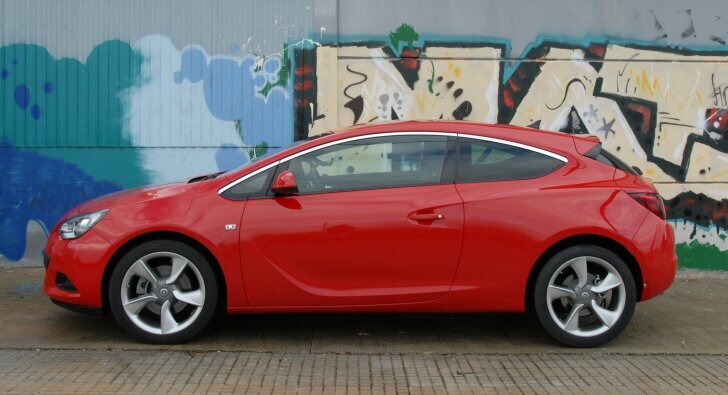 Judged by its looks alone the Astra GTC is a winner in all respects. The GTC is by far the best looking member of the Astra family. The lines ooze beauty and transform an ordinary car into an object of beauty. This work of art is only a bit more pricey than a normal Astra and much cheaper than most other coupés.